I was shocked to hear at my checkout counter a mom state her own laziness. While “It is so much easier to do it myself” does not sound like a lazy comment, I knew the context. She explained that it was too much work to train her child to clean. Much easier to do the work on her own and leave her son out of it. Working in the local grocery store in our tiny town, I knew this mom. I knew her son. A teenager myself, I should have taken her son’s side. But, I knew she wasn’t doing her son a favor. Now as I mom, I get it. Training a child to have a work ethic is ex-haust-ing! I find myself so frustrated. I doubt myself. Sometimes I want to throw in the towel. Bubs is fighting work big time. Unless it is his idea, watch out. Whenever told to do a chore, he screams, “I hate this,” falls to the ground, and cries. Drama, drama, drama! Timeout – we have not raised him this way. He has been helping with chores since he was able to walk and carry items. What is going on? Honestly, this carrying-on is draining me. I cower on the inside every time I ask him to do a job. I seriously don’t want to deal with the aftermath. But, I stand strong in my convictions. Bubs will help with chores. All of our children will help with chores. They are part of this family and this family works together. Period! For some reason Bubs hates to help with laundry. We stay consistent that as long as he throws a fit about doing laundry, this will be his first chore next time as well. On top of that, nothing else occurs before the chores he has been given are done. No mealtime, playing, etc. Not sure why he is bucking this so bad. At some point you think he would learn. Consistency. Consistency. Keep on. That is what I keep reminding myself. Kevin Leman says parenting isn’t easy. Nor is it convenient. So, I will continue giving our children age-appropriate chores. And I will pray that Bubs releases this iron-will towards work really soon. Good for you! It really is hard work teaching your children to work. At the moment one of my children is being very sneaky and quietly slips into another room, or conveniently has to visit the bathroom, when it's time to pack away the toys before dinner. As difficult as it is to confront a tantrum-throwing child, I find this deceitfulness even harder to deal with. This subject has come in so much in the last couple of days. 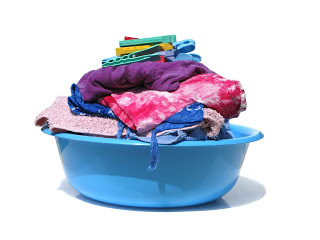 Back in the day, we had chores and we did them…no complaining! Now I look at my beautiful wonderful LAZY children and I realize I haven't done my job as a parent to instill a good work ethic. I understand what the lady at the checkout meant. I will do it myself so I will do the chore myself rather than as anyone else. It is not able if the chore is right–it is jyst the drama that will unfold if I ask for one of them to do it. ANy advice…. timeouts aren't productive for teens. They like the time away. Conservative Knit Mom – Thank you for your honesty. I believe the best answer for enforcing chores is "B does not happen until A is finished." Kevin Leman talks about this in his book "Have a New Kid by Friday." I have several reviews and blogs on this book. Another great source is Jim Fay's "Love and Logic for Teenagers." Search both Kevin Leman and Love and Logic on my blog and you should find several posts. Hope this helps. Fill free to email me with more questions.